So, who is Sal Curioso? 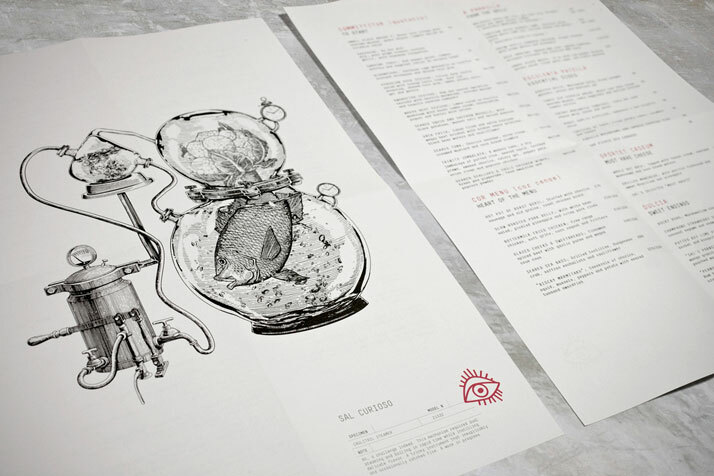 More than an eating establishment, Sal Curioso is Madame Sixty Ate's Spanish ex-lover. See, I told you it's quirky! To get to know Sal Curioso is to get to know and understand the design of the restaurant on a whole new fantastical level. 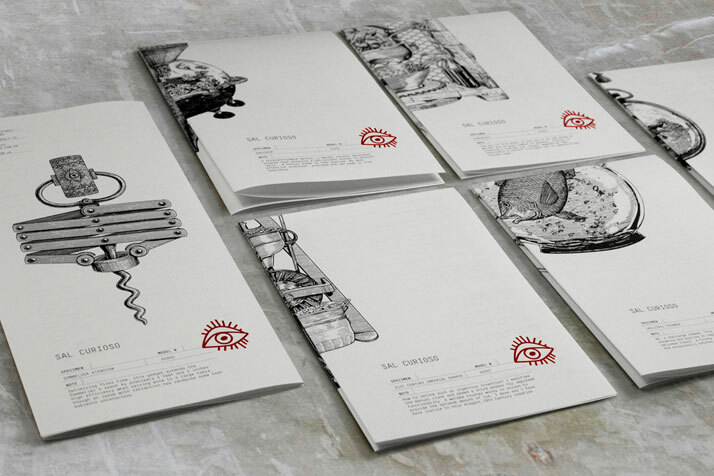 So what does this incredibly imaginative branding feel and look like as a package. 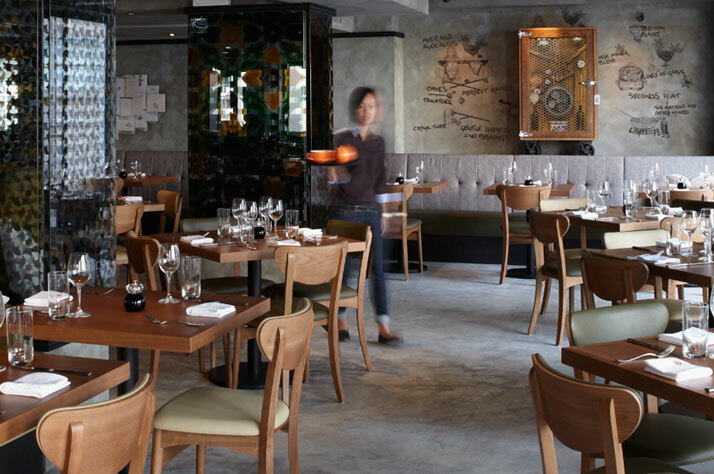 It's a restaurant that brings character and joy and the design is so thoughtful that you feel like you get to know Sal through a mixture of flavours, tastes and artifacts. 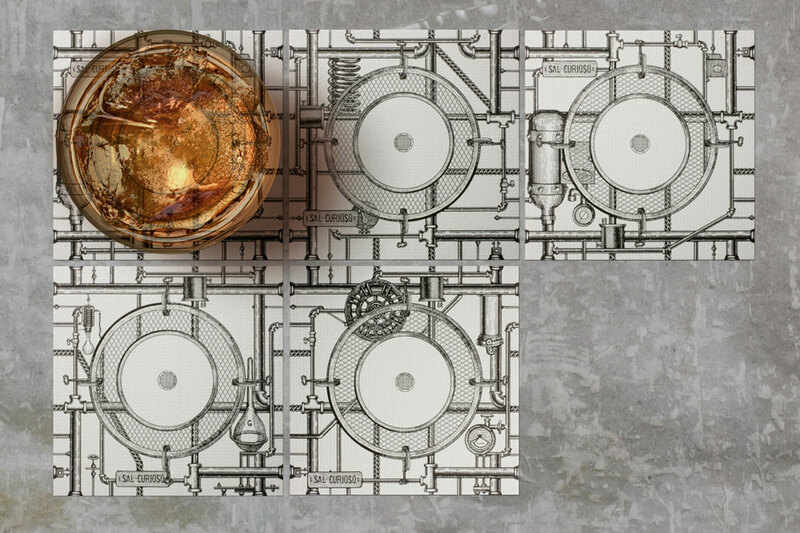 Everything in the restaurant has been designed to reflect Sal's personlity. 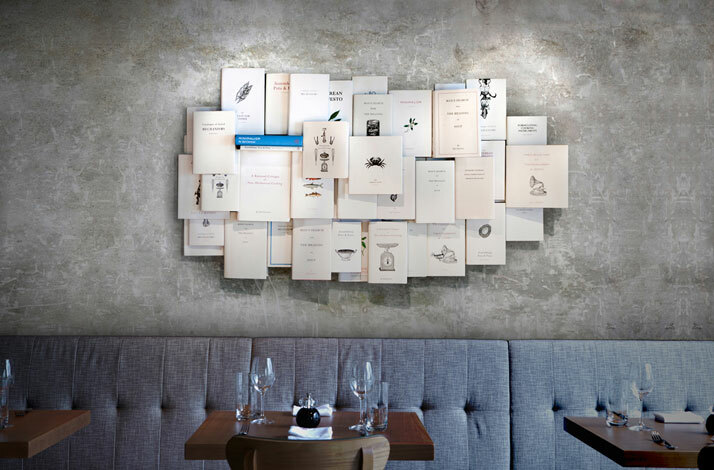 His schematic plans fill the menus and the installation of books displayed on the light neutral walls reflect how Sal is a prolific writer, full of new ideas. 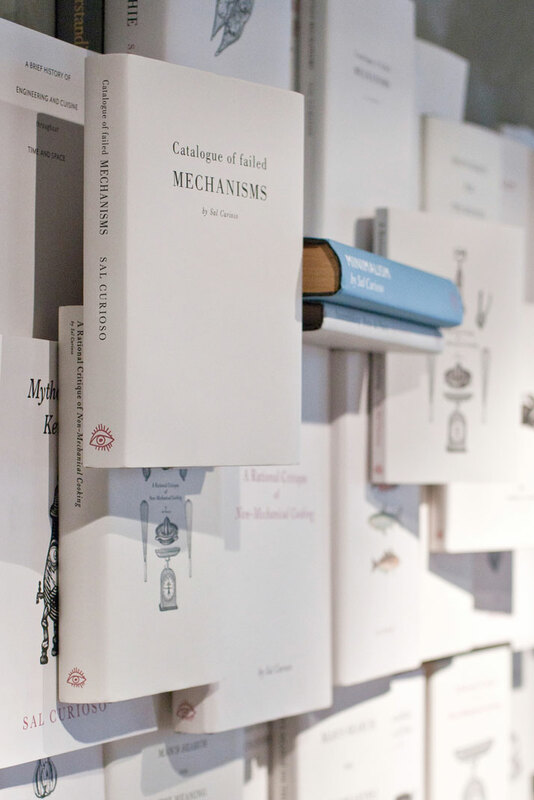 These installations include A Culinary Anthology and a Man's Search for the Meaning of Soup. This restaurant really is tongue in cheek and so interesting that it feels like you're dining in a curiosity shop of the chicest kind. 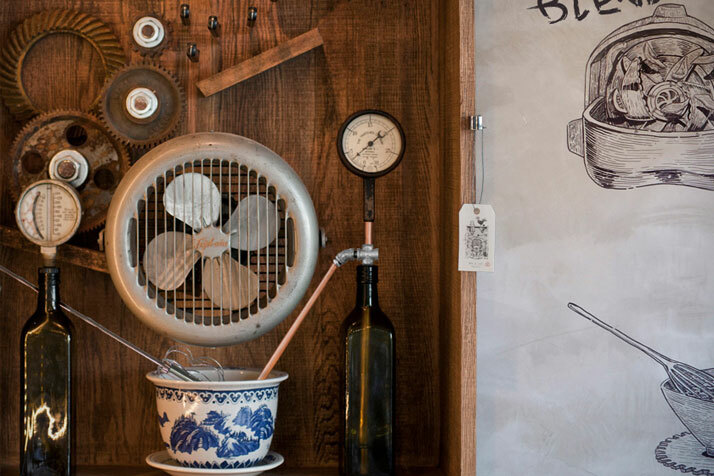 Sal Curioso designs and builds curious contraceptions and his inventions, which include the Duck Bobber, Caulitail Steamer, Squid Pop and Guacaloo, are all displayed throughout the 2,000 square foot restaurant space. 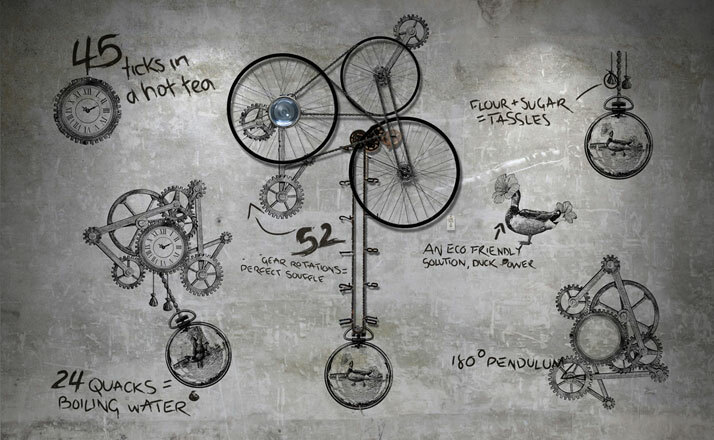 Each of these devices are accompanied by Sal's annotations, details of construction processes and his trademark scrawl. The walls, units and flooring have been kept parred back and simple to showcase the brand's personality. Sal's character eveolved out of passion and an inquisitive nature and spending time in this restaurant makes you continually want to find out more by discovering his ideas which adorn the space. 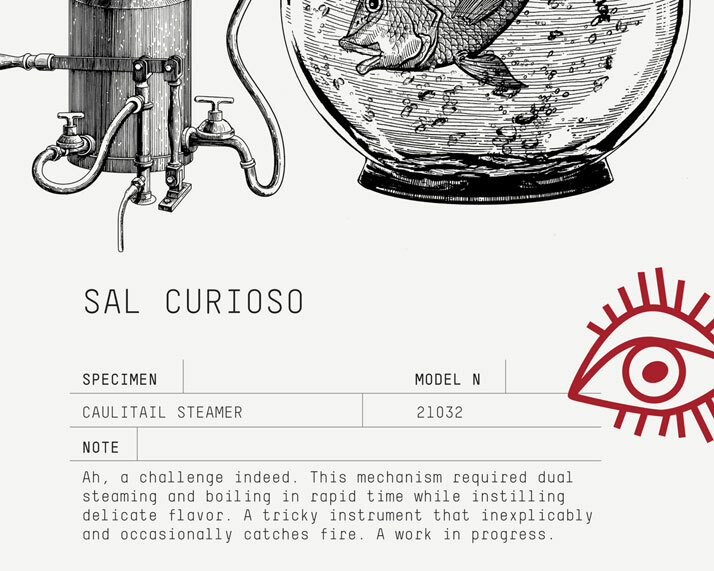 Entering Sal Curioso you feel like you've been invited to the workshop of a creative genius. Once inside the space you will innevitably feel like a 5 year old child mesmerised by what you see. Even the coasters on the tables have been carefully designed to draw water condensation from cockatils through a pipleine system that transports the liquid when the coasters are placed together to connect the pipes, I would challenge anyone not to have a ridiculous amount of fun in this restaurant. 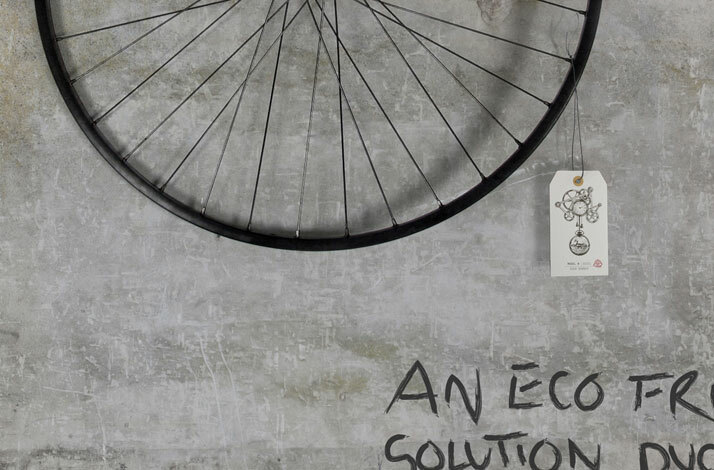 Sal's charisma is natural and not intentional and this is reflected in the design which feels personal and inventive. This is a dining EXPERIENCE (in every sense of the word) and, after meeting Sal, one you won't want to forget it in a hurry.